Deluxe Power type, powerfully assist you in variety of jobs. Power to rival some full size loaders. Oval lift arms provide outstanding shock and torsion protection. 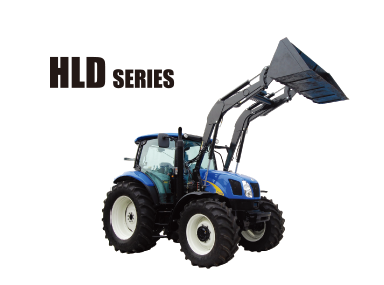 Compact and light weight design ensures superior maneuverability and user friendliness. Hydraulic Leveling and Float Action Systems. Easy Docking and One Action Coupling System. Please contact us for more information or a no obligation free quote. Full Color Control Monitor and more! 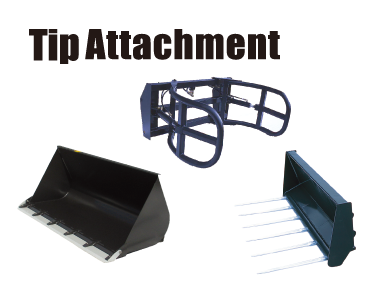 Select according to your application, such as the scooping and transportation of earth and sand, snow removal, grass collection, or transportation of containers. 1.Transportation of large-sized containers of beets, potatoes, and onions. 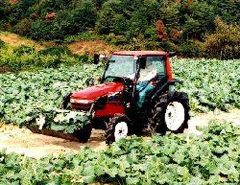 2.Harvesting and transportation of heavyweight vegetables, such as squash, cabbage, Chinese cabbage, and Japanese radishes. 3.Harvesting and transportation of konjac potatoes. 4.Harvesting and transportation of sugarcane. 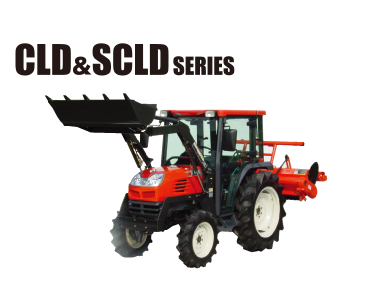 5.Transportation and spraying of compost to farm fields. 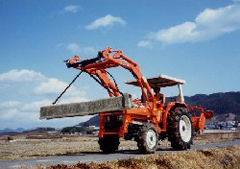 6.Transportation of wood pieces for growing shiitake mushrooms. 7.Processing of residual tobacco plants and transportation of leaves. 8.Loading and discharging of crops to and from trucks at the time of shipment. 9.Injection of fertilizer to lime sowers. 11.Loading of compost onto compost spraying machines. 14.Collection, transportation, and loading of pumice soil. 16.Transportation of pillars for drying Japanese radishes. 17.Land digging for soil improvement. 18.Spraying of agricultural chemicals from a height. 19.Lifting of wood pieces for growing shiitake mushrooms at the time of chemical dipping. 20.Lifting of tobacco leaves to driers. 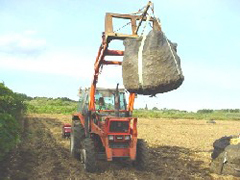 21.Removal, collection, and transportation of stones from farm fields. 22.Processing of residual eggplant vines. 23.Lifting of flexible containers of carrots. 24.Collection work of kudzu potatoes. 25.Transportation of cropped soybeans from farm fields. 1.Loading, transportation, and spraying of compost. 3.Taking out and transportation of silage from bunker silos. 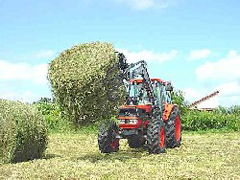 4.Collection and transportation of pasture grass. 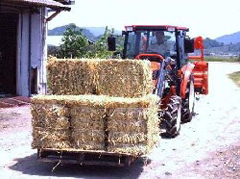 5.Loading of pasture grass rolls onto trucks for transportation. 6.Stack storage of pasture grass rolls. 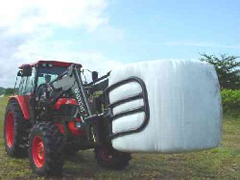 7.Heaping of rolled silage on wrapping machines. 9.Collection of feces and urine from barns and henhouses and barn and henhouse cleaning. 11.Injection of rolls to mixing machines. 12.Roll rewinding and spreading for the re-drying of rolls. 13.Hedge bucket work on corn harvesters. 14.Loading of hay cubes to the second floors. 15.Loading of cows and hogs to trucks. 16.Transportation of wrapping film for disposal. 17.Heaping of old tires used for weights on the bags in bunker silos. 18.Piling and installation of pasture barriers. 20.Digging for retired cows and chickens. 1.Movement of soil and leveling of paddy fields. 2.Collection, loading, and transportation of soil for seedling raising. 3.Leveling of seedling raising beds. 4.Transportation of seedling raising boxes. 5.Digging and backfilling of drains (open ditches). 6.Collection and stacking of straw. 7.Loading and discharging of rice. 8.Loading and discharging of fertilizer. 9.Digging and backfilling of fertilization trenches. 10.Hardening of paddy field dikes. 11.Breaking of paddy field dikes. 12.Transfer of soil to vegetable fields as a result of crop changeover. 14.Transportation of rice bran after rice cleaning. 1.Digging for the transplanting of fruit seedlings. 2.Collection and transportation of pruning branches. 3.Lifting and transportation of garden stones. 4.Digging of orchards for fertilizations. 5.Digging, collection, and loading, and discharging of flowers and garden trees. 6.Transportation of materials for assemblies, such as pillars. 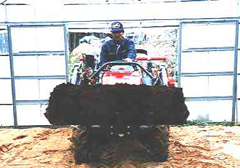 7.Collection of soil into greenhouses and transportation and spraying of compost. 8.Use as a simple crane for tools and equipment at the time of greenhouse assembly. 9.Stump pulling of fruit trees. 11.Soil filling of strawberry pots. 12.Collection of melon and watermelon vines. 13.Used for a work tool bench at the time of fruit cropping. 14.Loading and transportation of saw dust and chaff. 16.Lifting of work tools at the time of garden tree pruning. 1.Snow removal from private, community, and farm roads. 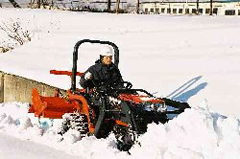 2.Snow removal from the parking lots of facilities, such as supermarkets, stores, convenience stores, and gas stations. 4.Shaving and removal of hard-trodden snow. 5.Removal of snow dropped from roofs and hardened. 6.Removal of ice from frozen road surfaces. 8.Snow removal under the lifts of skiing areas. 9.Loading of snow to dump trucks. 10.njection of snow into snow melting machines. 1.Leveling work as infrastructural improvement. 2.Transportation of stones as infrastructural improvement. 3.Intermountain road construction and restoration. 5.Transportation and embedding of U-shaped and clay pipes. 6.Digging and transportation of additional soil. 7.Stacking of sandbags at the time of flooding. 8.Replacement of the sand in sandboxes. 9.Garbage collection in the sands, such as beaches. 10.Sludge collection and transportation in rivers or trenches. 12.Maintenance of stadiums and parks. 13.Loading and transportation of earth and sand, ballast, blocks, and wood. 14.Spraying of joint soil on golf courses. 15.Transportation of bunker sand to golf courses and bunker leveling. 17.Striking of pillars for protection against winds. 18.Hole digging of stakes and poles. 19.Lifting of owned machines, such as a work machine and dynamo. 21.Used as a floodlight with a light attached to the front end of the arms. 22.Lifting and transportation of rental boats from ponds. 24.Wall coating with the back of the bucket. 25.Demolition of concrete block walls. 26.Restoration after the occurrence of disaster. 2.Used as a weight for heavyweight work machines connected to the rear side. 3.Rescue of machines stuck in farm fields. 4.Used as a lift for the storage and extraction of materials and crops on the second floors of barns. 5.Injection of gravel and sand to shrimp farms. 6.Use as an escape tool in place of a jack to rescue the user trapped in mud. 8.Used as auxiliary apparatus for shade and rain cover sheets. 9.Transportation of wood from the mountains. 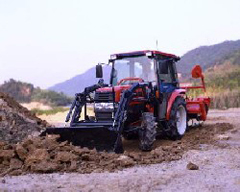 12.Transportation of materials for athletic meets and land maintenance work, such as field leveling. 13.Transportation of materials and preparation for fairs. 14.Embedding of materials after processing. 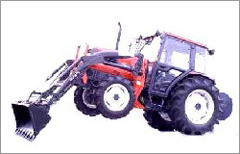 At the time of inspection, locate the loader tractor in a flat place and ground (or disconnect) the loader, stop the engine, and apply the handbrake. In order to use the loader and tractor safely for a long time, make daily and regular inspections according to the following table. ・Make a visual inspection and tighten each of them (if the spring lock washer is rising from the attaching portion. ・If the loosening of bolts and nuts occurs frequently, replace the bolts, nuts, and spring lock washers. Check on the grease and oil on each pin and rotation part. ・Perform lubrication and oil supply. Add pins, if missing. Check on the quality of operating oil. ・Supply additional oil to a proper level. Exchange the oil if the existing oil is dirty. Check on the unusual bending or twisting of the hose. ・Loosen the metal fittings on both ends of the hose, and retighten the fittings after restoring the hose position so that there will be no bending or twisting. ・Exchange the hose every two years. Crack on the surface of the hose. ・If there is a crack, exchange the hose immediately. Check on other damaged parts, if any. ・If there are any broken parts, repair or replace the parts. Attachment of a rear wheel weight. 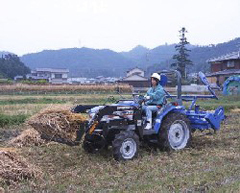 ・Be sure to mount the loader at the time of work. Oil leakage from the hose or hydraulic parts. ・Replace or increase the packing. The wear and tear of each pin and bushing. ・Exchange the pin if the wear and tear of the outer diameter of the pin exceeds 2 mm. Loosening of each bolt and nut. ・Tighten the loosened bolts and nuts. ・After the loader is assembled. After 5 hour’s use. ・Every 50 hours’ use after that. 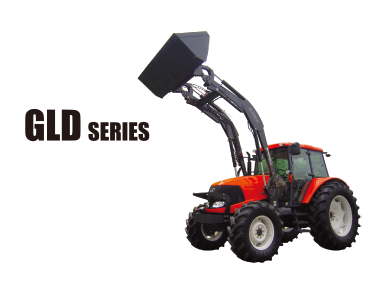 For details, contact your Sanyo Kiki dealer, the Japan Agricultural Cooperatives (JA), or us. The following demonstration videos (in WMV format) are available.